As many of you may know, I have been waiting for quite some time to add this girl to my Indian Pony Conga Line. She is a 1996 Series Run from State Line Tack named Halayi. Her soft golden color with the white mane and tail are just beautiful. For a bit of added interest she sports snowflake type Appaloosa spots on her rump and has some darker shading around her knees, hocks, ears and muzzle. Indian Pony Halayi is one that I have seen retain her value quite easily for the Breyer Collector. And because she has proven to be so photogenic as in the Greeting Card with her picture, I don’t think I will part with her very soon. 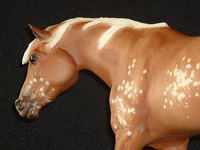 In 1997 and 1998, Breyer released "Full Speed", a darker shaded palomino snowflake appaloosa with resist spots on the haunches, barrel, shoulders and face. Apparently there are variations of this model, however, I have only seen the one that I have and have not been able to compare. And thus grows the collection, for comparison purposes…. 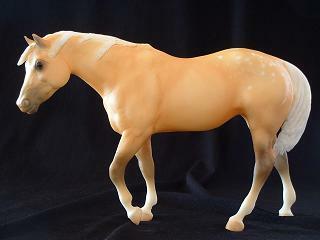 Another Indian Pony model I am quite sure would be on any IP collectors list would be the SR of 1994: the Breyerfest Volunteer Model. There were only 30 made in a matte red roan with variations. She is the crème de la crème of the any one's Indian Pony collection. I'm still waiting for mine.